Five employees from divisions of United Technologies Corporation (UTC) were honored recently for completing their graduate certificates in Advanced Systems Engineering through the University of Connecticut’s UTC Institute for Advanced Systems Engineering (UTC-IASE). Earl Lavallee and Sara Pacella of UTC Aerospace Systems; Xibei Ding and Ajay Phadke of Pratt & Whitney; and Cheryl Keiling of UTC Climate Controls and Security were honored during the UTC Technology Council meeting in Windsor Locks, Connecticut, on Jan. 20, 2016. Dr. J. Michael McQuade, UTC Senior Vice President, Science and Technology, presented the awards, and noted the potential of the engineers to drive revolutionary changes in the deployment of model-based systems engineering across UTC’s divisions. He encouraged the graduating engineers to take leadership roles in advancing systems and controls engineering through rigorous modeling-based methods and tools. The five honorees comprise the first cohort to complete the graduate certificate program. Each pursued the program’s Controlled Systems track. The graduate certificates in Advanced Systems Engineering are offered under the UConn’s UTC-IASE umbrella. The UTC-IASE is a unique model-based approach to systems engineering — creating a new paradigm in interdisciplinary engineering education, research and outreach to industry. The institute is a research and teaching establishment in the science and technology of complex systems, with a goal of revolutionizing the design of functionally superior, easy-to-use and maintain, safe, reliable, secure and trustable systems that are built from — and are dependent on — the combination of computational and physical components. The UTC-IASE offers graduate certificates in Advanced Systems Engineering along three tracks: System Design, Controlled Systems and Embedded Systems. These certificate programs are extendable to Master degrees in engineering. 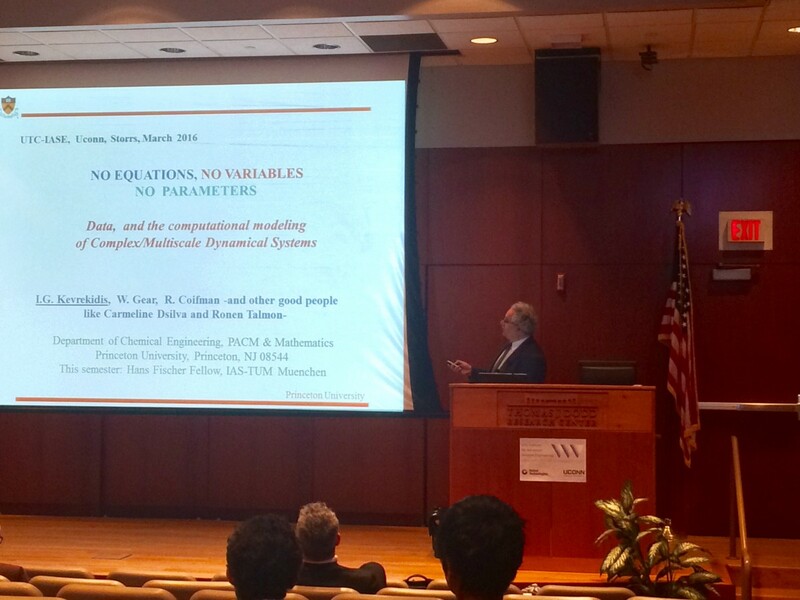 Professor Ionnis Krevikidis spoke about data, manifold learning, and the modeling of complex/multiscale systems on March 10, 2016 as a part of the Distinguished Lecture series at the UTC Institute for Advanced Systems Engineering. He discussed some recent developments on the connection between data mining/machine learning on the one hand, and the modeling of complex/multi-scale problems on the other. The talk addressed the interface between fine scale, atomistic/stochastic codes and coarse-grained, macroscopic descriptions. In particular, Professor Krevikidis discussed (a) the reduction of stochastic simulations through diffusion maps and the use of the Mahalanobis distance, and issues of heterogeneous data fusion; (b) the issue of extending diffusion-map based simulations to new configurations/conditions; and (c) the issue of not only reducing the number of independent variables, but also reducing the number of independent parameters by taking advantage of data-mining tools. 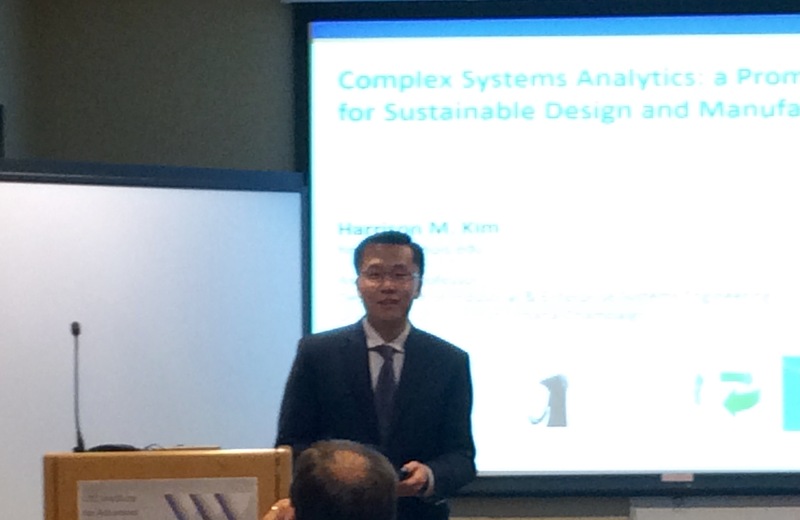 Professor Harrison Kim from the University of Illinois at Urbana-Champaign presented a seminar on March 8, 2016 on the topic of “Complex Systems Analytics: a Promising Enabler for Sustainable Design and Manufacturing.” Designing large-scale, complex systems has been a challenging task, particularly in the predictive context of life cycle. Key challenges arise in various stages of system’s life cycle – pre-life, usage life, and end-of-life – where massive-scale data is generated and captured from complex systems design, operations, and disposal. Green Profit Design – a new term coined by Kim’s team – shows that there is a strong link between sustainable product design, user generated contents in the social network service, and corporate profit generation. Green Profit Design has been shown to be successful in designing optimal, sustainable product portfolio by use of engineering design optimization and knowledge discovery for user preference capture. In this presentation, Professor Kim presented a summary of the recent findings that there exists an optimal design and remanufacturing threshold for maximum benefit of profit and environmental impact savings. The projects are sponsored by the National Science Foundation and Deere and Co. – green, sustainable design and recovery; sustainable product family design and recovery; trend mining design for product portfolio optimization.